SANDRA ''SANDY'' A. CLAY CANFIELD - There will be a Mass of Christian Burial at 11 a.m. on Friday, Aug. 26, at St. Michael Catholic Church in Canfield for Sandra “Sandy” A. Clay, 76, who died early Monday morning at Assumption Village in North Lima. Sandra was born April 27, 1940, in Youngstown, a daughter of the late Jesse R. and Rita A. Gaber Whittaker, and was a lifelong area resident. She graduated in 1958 from Ursuline High School and received her Bachelor’s and Master’s Degrees in Education from Kent State University. 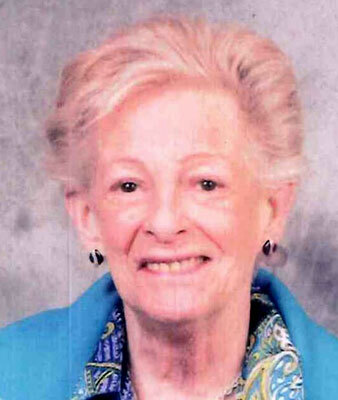 Sandy had taught Math at the former Boardman’s Glenwood Middle School for eight years. She then had owned her own frame shop for over 20 years, retiring in 2010. She was known for her sense of humor and had loved to travel. She especially loved her trips to Canada and Alaska. Sandy was a charter member of St. Michael Catholic Church, and also a charter member of the Youngstown Embroiderer’s Guild. She leaves her husband of 49 years, Curtis B. Clay; her son and daughter-in-law, Commander Matthew C. Clay USN retired and Kerry Clay of Virginia Beach, Va.; a sister, Judith A. (John L.) Masucci of Poland; and three grandchildren, Ryan, Abby and Emily. Sandy also leaves one nephew and two nieces. Besides her parents, Sandy was preceded in death by a brother, Robert J. Whittaker. Friends may call on Thursday from 5 to 8 p.m. at the Lane Family Funeral Homes, Austintown Chapel. The family would like to thank the doctors, nurses and staff of Humility of Mary Health Partners, Assumption Village, Hospice House and the Cardiovascular Department of the Cleveland Clinic for their wonderful care given to Sandy. They would also like to thank Sandy’s best friend, Sally (David) White of Scottsdale, Ariz. and good friends, George and Anne Tully of Canada for their love and support given to Sandy and the family over the years.